I like this new version because he can stand up! at least 2 buttons for eyes (more for decorations)*not for children under 3! 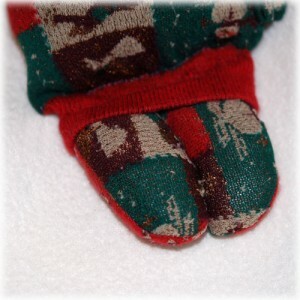 If you are not familiar with making the basic sock bunny there are photos and more detailed instructions here. Most of the steps for this one are the same. Lay one sock out with the heel facing you and cut, starting at the toe and stop a little before the heel (see photo –it will make sense). Turn the sock inside out and sew the “ears” from the tip down toward the “head” at an angle (you don’t have to angle it, but you will get a nice pointy ear if you do. Turn them right side (use a chopstick or something if you need help getting them turned). Gather the ears into a sort of bundle and stitch across them with your machine. 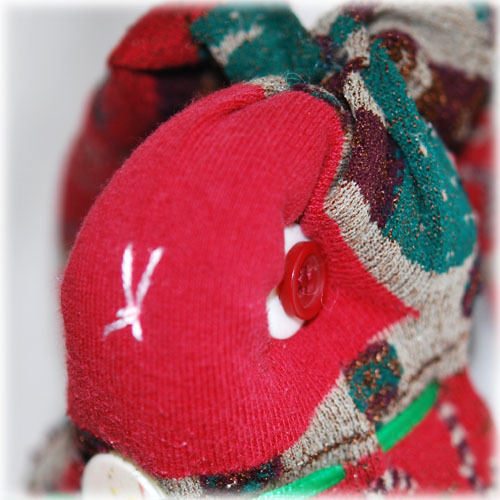 If you’re making a girl bunny you can also tie them with a bow if you prefer (or you can stitch them and then tie a bow). Stuff the head until it’s pretty plump and sew on the eyes. I stacked a red button on a white button. Sew across, back and forth so that you get an “indentation”. See the photo if you don’t understand what I mean. And sew back and forth 4 or 5 times so that they stay on. I also want to remind you again buttons are not appropriate on toys meant for children under 3 years old! Finish stuffing the bunny and sew up the bottom, leaving the cuffed end open. Use a matching or contrasting ribbon in an embroidery needle and stitch it around the neck as an embellishment and also to give a little distinction between the head and the body. 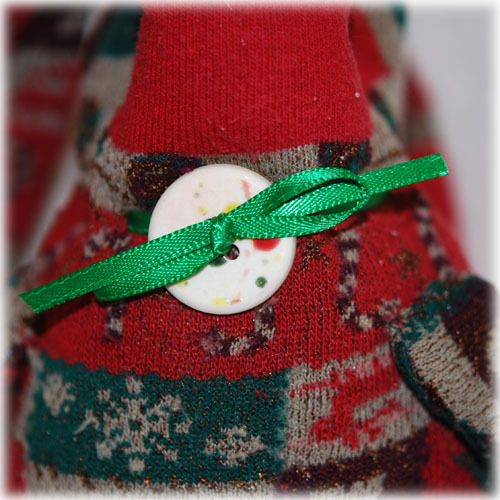 I finished it off with a pretty button, but you can just tie a bow. Cut arms, using the other sock. I cut 2 strips across the leg part of the sock a little wider than I wanted the arms to be (about 2 inches). Then I sewed up the two open sides. I didn’t stuff these arms like I did the others, as I wanted them floppy. 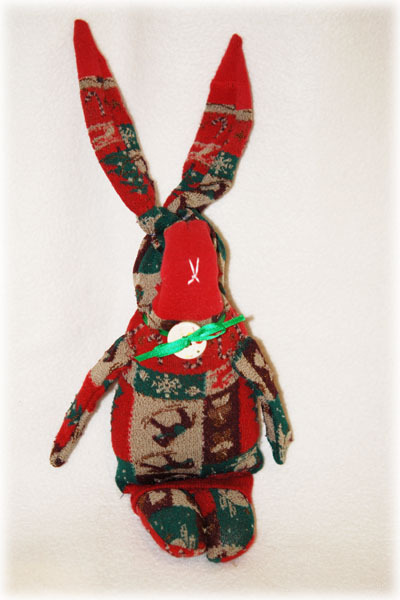 Attach the arms by hand stitching them to the sides of the bunny under the head (turn them under). I stitched them twice so they will stay on. Make feet. Cut 4 identical long oval pieces from the second sock. 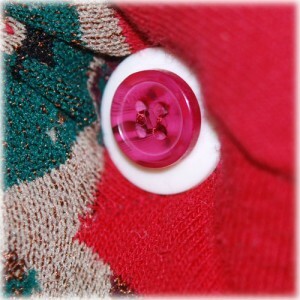 Turn each “pair” inside out and stitch them on your machine except for an opening at one end (the back). Turn right side and stuff. Use your sewing machine to stitch them closed (it doesn’t matter how this looks as it will be hidden under the cuff). Using pink embroidery floss stitch a bunny nose and mouth. I have settled on a simple X but you can do whatever you like, especially if you’re skilled at needlework. The cool thing is, he actually stands up! I think if you make the feet too small he won’t, so don’t skimp on his feet. I also loved that the patterned sock look like he’s wearing a sweater! Actually shouldn’t that be sit up? 😛 He’s very cute sis :).